You decide to drive the long way home from work, taking the scenic route to clear your mind. Everything is nice and pretty until… bump! You just hit a huge pothole in the road, and now you hear a clanking sound. Is damage from potholes covered by your auto insurance? The simple answer is, possibly. Pothole damage is covered if you have collision coverage on the vehicle you’re driving. Collision coverage is not automatically included on your auto policy. It’s also one of the most expensive parts to a policy. If you have a loan or a lease, the financing company will likely require you to carry collision coverage. Collision covers damage to your vehicle that came from hitting another vehicle or a solid object, such as a telephone pole or building. While hitting a pothole technically isn’t either of those things, it still falls under collision. The only issue with potholes being covered under your policy is in proving that the pothole caused all of the damage. Wear and tear to your vehicle is not covered under any part of your insurance policy. This means that if you have old tires that needed to be replaced 10,000 miles ago, and then you hit a pothole and your tires are damaged, your insurance company might deny the claim. The same is true with any other part of your vehicle. Normal wear and tear is never covered. But if you keep your car in good shape, get routine maintenance on it, and replace the tires at normal intervals, then you should be fine. Any collision claim will also have a deductible to it. Deductibles are simply the amount of money that you are covering for a claim. The insurance company will pay out any damages that they owe you, and then subtract the deductible from that amount. For example, if you have $10,000 in damages and a $1,000 collision deductible, the insurance company will pay you $9,000. Is it worth it to file a pothole claim? Knowing what your deductible is can be an important factor in determining whether to turn in your pothole claim to your insurance company. If the damage amount is $700 and you have a $500 deductible, it probably doesn’t make much sense to file a claim because you will only receive $200. You’ll also need to factor in what this claim might do to your rates at your next renewal. 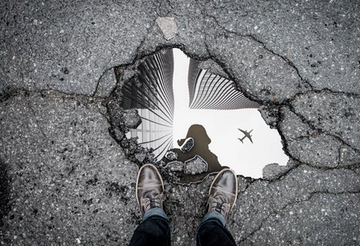 Filing a pothole claim is classified as an at-fault accident. These are the types of accidents that can affect your rates the most. While you can try to argue that it was not your fault, maybe it was the weather’s fault or city’s or state’s fault for not maintaining the road, you won’t have much luck arguing this with the insurance company. This doesn’t mean that you can’t file the claim. If you have thousands of dollars in damages, then it makes sense to file it and have your insurance company pay to fix the damage. Just be aware that your rates will likely increase at your next renewal policy. There’s no right or wrong answer to filing a claim or not, but generally, it’s better to file claims if you have a greater amount of damages. Try to pay for smaller incidents out of pocket and save that insurance claim for the bigger ones. One type of coverage that can be particularly useful in dealing with pothole accidents is roadside assistance. Not all insurance companies offer this, but most do. It usually doesn’t cost much either, with $10-$30 being a normal amount for the entire policy period. Roadside assistance services can help if the pothole causes your tire to burst and you don’t have a spare. They can either bring a tire out and replace it themselves, or tow your car to the nearest body shop to get it fixed. Usually, you don’t have to worry about a deductible with roadside assistance services, and they are available 24 hours a day. Some companies offer towing & labor coverage, which is slightly different. Instead of providing the service directly to you, this coverage simply reimburses you for the cost of the roadside assistance. This means that you would be responsible for finding a roadside assistance or towing service and getting help. You would pay that company initially, and then your insurance company would reimburse you up to the towing & labor limit that you carry. Each company offers slightly different services, so check with your insurance company to see what kind of roadside assistance or towing services they offer, what they cover, and any limitations. Hitting a giant, hidden pothole can ruin a good day. But if you have collision coverage on your vehicle, then at least you might not have to pay for much for the damages.